Designed for superior sound quality in a contemporary, compact design. Panasonic has today launched its first smart Hi-Fi speakers with Google Assistant built in, designed to fill the room with rich, robust sound while being compact in size. The SC-GA10 speakers include all of Google Assistant’s voice-assisted operations and support all major music streaming apps including Spotify, Google Play Music, and Tune-in radio. “Research shows almost 65 per cent of smart speaker owners are using their products primarily to listen to music[i]. This is where the new Panasonic SC-GA10 smart Hi-Fi speakers really excel, by offering Panasonic’s high-quality sound technology that any music buff will be impressed with,” said Aaron Waters, Product Marketing Manager – Audio & Video, Panasonic. 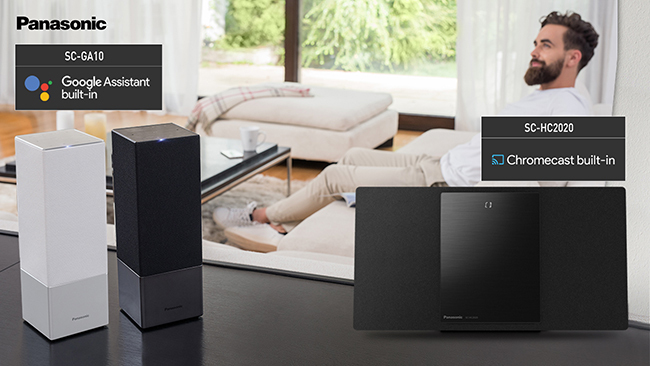 Panasonic audio technology delivers serious performance in a compact body to fill a room with sound. The SC-GA10’s capabilities ensure balanced audio with smooth mid-range and distortion-free treble as well as strong bass. At the front of the speakers, the two 20mm Soft Dome Tweeters have been specifically designed with a silk diaphragm for the diffuser, opening at a 45º angle. This gives a full 180º range to high-frequency directional sounds to create a wide, smooth and expansive audio effect. To ensure crisp, clear vocals, an 8cm woofer with a Dual Voice Coil will suppress any acoustic impedance, rising between the medium- to high-frequency audio range. Compared with the single coil ordinarily used in woofers, the Dual Voice Coil produces a much more robust and impressive bass sound. The bass sounds are further enriched by a Long Port Back Bass Reflex System. Additionally, the Meshed Diaphragm with a Wide Role Rubber Edge design efficiently reduces distortion in the low-frequency sound range. The SC-GA10’s simple yet modern styling blends seamlessly and unobtrusively into any room interior. The speaker has an attractive vertical design, with a sleek aluminium base combined with a fine, fabric mesh overlay. The SC-GA10 is available in the classic monogram colours of black and white and adds a subtle touch to the elegance of any room. With the simple voice command of “Ok Google” to start a conversation, the SC-GA10 can stream music, answer questions and even control other compatible smart devices – such as Chromecast devices (either built-in or external), smart lights or temperature controls – via Google Assistant, to provide a seamless, coordinated experience. 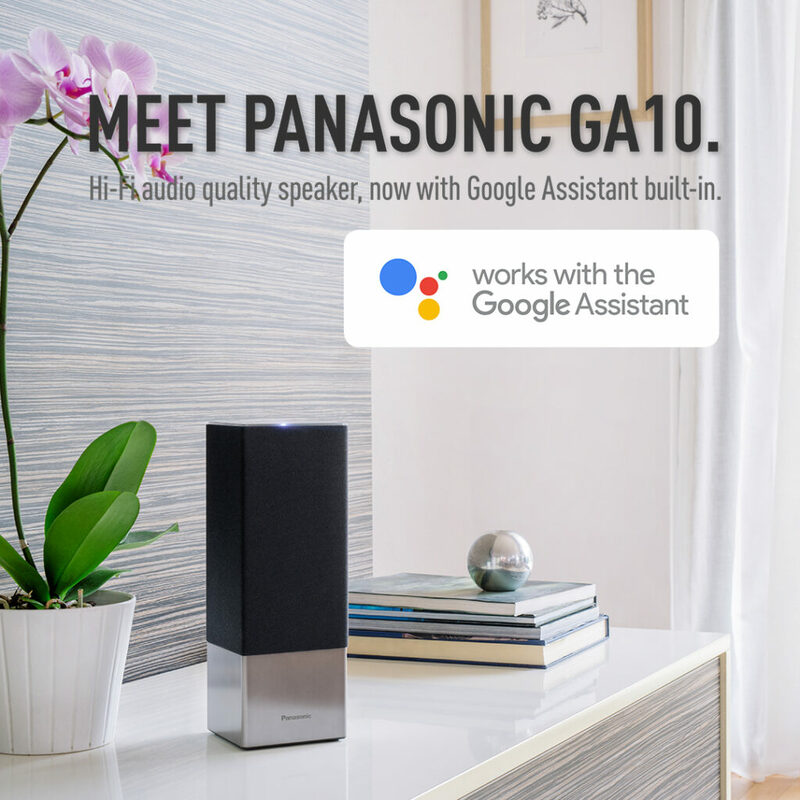 Google Assistant’s Multi-room Audio function means users can also combine the SC-GA10 with Chromecast Audio or Chromecast integrated speakers – including Panasonic’s new SC-HC2020 micro hi-fi system – allowing music lovers to sync and control music playback through multiple speakers. A new Panasonic Music Control App has been released alongside the launch of the SC-GA10. By connecting the SC-GA10 to this app, the user can play music stored on a smartphone, tablet, or network-attached storage (NAS), while also taking advantage of a variety of unique functions. These functions include changing EQ settings, Stereo Pairing[ii] – where users can connect two SC-GA10 devices – and Party mode that transfers Bluetooth and AUX sound sources to multiple SC-GA10 speakers. The Music Control App’s unique features will continue to grow, with further updates in the future. The SC-HC2020 – featuring Google Chromecast built-in – SC-HC302, and SC-HC200 micro hi-fi systems are housed in a compact design that harmonises with stylish room interiors and delivers, high-quality sound. With Chromecast built-in, the SC-HC2020 supports CD playback and radio listening and provides access to a wide range of music services via apps including Spotify, Google Play Music, TuneIn Radio and Deezer. Multi-room sync plays music across Chromecast compatible speakers. When combined with a Google Assistant Speaker such as the SC-GA10, the SC-HC2020 can be voice-controlled. Use easy voice commands via the microphone embedded in the SC-GA10 to play streaming services and podcasts from the SC-HC2020. The 8cm full-range speaker units contained within the micro hi-fi systems offer a fantastic music experience with room-filling sound that is pure and distortion-free. In addition, the SC-HC2020 incorporates Panasonic’s unique Twisted Acoustic Port, which amplifies resonance to produce robust bass sounds. All new micro models can play CD and radio as well as other music sources via Bluetooth, and the SC-HC302 is also equipped with AUX-IN Auto Play. Simply connect an existing audio device or streaming device, such as Chromecast Audio, to AUX-IN. Even if the SC-HC302 power is turned off, the sound signal from the device will be recognised, power will be automatically turned on, and music will be played from the AUX terminal. 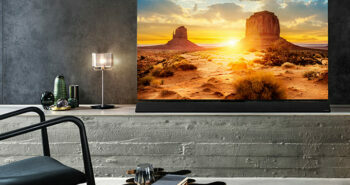 Panasonic has added a mini soundbar to its line-up – the SC-HTB250 – which is designed to conveniently pair with the new FX700 and FX600 Series TVs to boost the cinema experience. It fits snugly under the TV’s adjustable Switch Pedestal thanks to its compact profile, and can be controlled by the TV remote if required. It offers wireless Bluetooth capabilities for music streaming, and the wireless subwoofer can be placed freely in the room in a horizontal or vertical configuration. 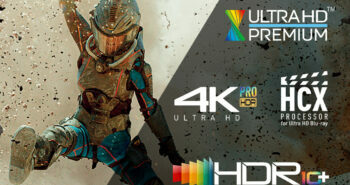 The bar supports HDMI with Audio Return Channel (ARC) and optical connections. [i] Research by Panasonic in the US, UK and Germany, May 2017. [ii] Stereo Pairing will be available later in 2018 via firmware update.